Network Support | Innovative Network Solutions, Inc. When designing a network infrastructure, it's important to get it right from the start. Your network infrastructure is the backbone to your entire technology system. A sound, well documented, and properly designed network infrastructure can help alleviate large technical issues down the road. INS network support can include design, deployment, monitoring, and upgrades. INS can provide network design services to build a customized network infrastructure from the ground up, or we can provide support to your existing network. We perform thorough evaluations of your network's overall performance, rooting out congestion points and any potential for operational failures. When it comes time to replace portions of your network infrastructure, we find you the right pieces to ensure a seamless transition. Cost effective Network Administration services and then some. The average cost of an in-house Network Administrator in the southeast Michigan area is approximately $48,000 per year. The cost of an INS technician to be on-site 5 days a week for a year...roughly $25,000. That's almost HALF the cost of a direct hire AND our technicians aren't just one trick ponies. They specialize in many areas across IT spectrum to provide the most comprehensive service possible. Think of it as receiving multiple IT professionals for just under half of the price of one. Protect your company financials, customer and employee information from the outside world by making sure your Network Security is at optimal performance. 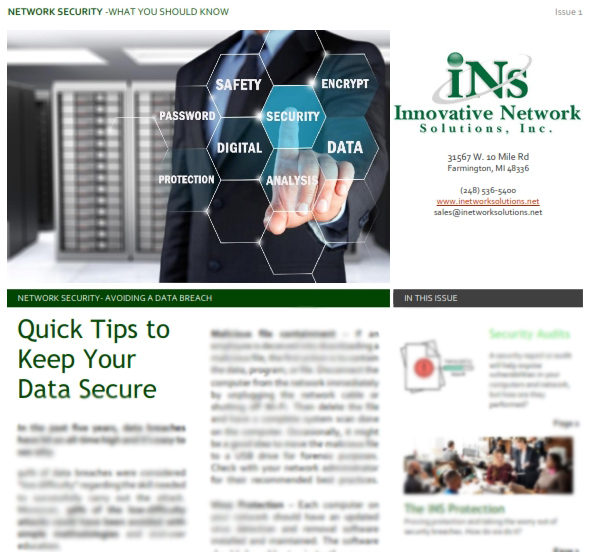 FREE Quick Tips to Network Security Guide! Network Design, Network Administration, Network Security- all are part of the INS Managed IT Solutions. If you need help with a new or existing network, contact us at (248) 536-5400.